Women in Ethiopia face many barriers to becoming entrepreneurs. They often have less education than men, can face discrimination, and are less likely to own assets like as a house or land, so it can be harder for them to find collateral for a loan to establish or expand a business. For these reasons, women entrepreneurs in Ethiopia have fewer opportunities than do men. In 2012, Ethiopia ranked 107 out of 112 countries on the Economist’s Women’s Economic Opportunity index. Tsege Afrassa is helping women create opportunities for themselves. Tsege and her friend Anteneh Tasew are two #DOTYouth that are equipping women entrepreneurs in Ethiopia with the tools, skills and networks to strengthen their businesses. Tsege and Anteneh are working with DOT Ethiopia in local communities to offer financial, digital, and entrepreneurship training. In the process, they are learning about the real needs in their community and creating new opportunities. With Tsege and Anteneh’s support and coaching, women from local communities interview their customers and competitors, define their business vision, and develop business plans. Initially, the women entrepreneurs participating in the program were reluctant to share their ideas with the other participants, and they stayed quiet. Slowly, as the women got to know each other over tea breaks and in peer coaching sessions, they became more comfortable and began to share openly, creating meaningful bonds. In fact, as the training continued, the group of women realized how important it was to have a community of entrepreneurs they could rely on. The women didn’t want to lose this community when the training ended. Identifying this need and opportunity was the spark that inspired Tsege and Anteneh to found the ENAT Association. Named after the Amharic word for “mother,” the ENAT Association helps its members strengthen their businesses. Women can promote their individual businesses through the association, and organize and participate in bazaars and expos as a group. Soon, they will ask the city administration for a space at the marketplace in order to sell their products together. There is strength in numbers, and ENAT Association is helping women entrepreneurs do what they may have not had the confidence or skills to do alone. 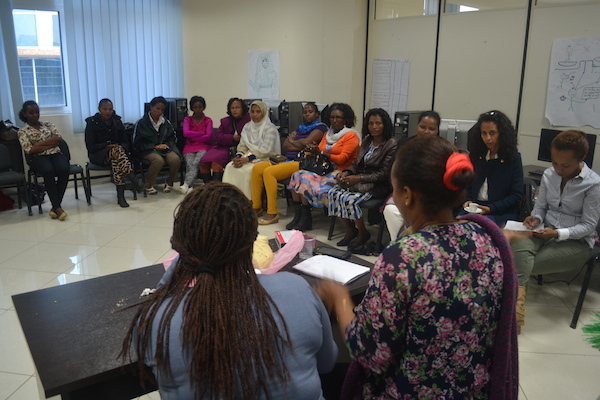 DOT Ethiopia’s Business Development Center supported ENAT to join the Ethiopian Women Exporters’ Association, to further connect them with the network of women entrepreneurs in Ethiopia. Tsege and Anteneh are proud of the role they play in helping women entrepreneurs develop the tools, knowledge, and networks to transform their own communities and create opportunities. *The World Bank (2016), From Learning to Earning: Impacts of an Innovative Entrepreneurship Training.